You will sometimes find yourself receiving SMS messages in your phone from numbers not listed in your contacts. These are special numbers of four to five digits only, and they usually bring you information about many things. Sometimes, it contains news alerts of recent happenings around, or it may be informing you of the latest promotions going on. These messages come from different companies like banks, boutiques or news agencies. These are free SMS services they offer to keep the public informed and aware about the latest bits. For example, a bank can notify the public via text messaging their increased interest rates offered. Or a shop can promote their ongoing anniversary sale. Different companies resort to this kind of propaganda because it is cheaper and reaches a wider base. Messages are sent in real time, and the recipients can read these pieces of information at their own free time. Conceived as an innovative, value-added feature to mobile phones, it was originally advertised as a tool for the hearing-impaired. Now, a few short years later, SMS services have proven to be an efficient messaging system whether for personal or business purposes. However, cell phone-to-cell phone SMS services are no longer free. There is now a free way to send SMS messages in the internet. Online marketers and internet experts saw SMS services' huge potential as an effective marketing tool. Thanks to technology and innovation, various websites, including Instant Messaging (IM) clients now provide free SMS services. Online messaging is easy. Launch your browser or your favorite IM client. Access your contacts and type in a quick message. If you've not already saved your intended contact's mobile phone number online in your detailed contacts information list, key-in the mobile number. Hit that send button and in less than five seconds, your message winds up in the recipient's inbox. It saves you time, effort, and money. Free SMS service is a brilliant way to make sure you don't miss out on any opportunity to make a sale. If you are a marketing consultant, free SMS services are excellent tools to reach a broader market base, send info messages out to consumers, and receive consumer feedback. Business development executives make use of free SMS services to generate leads and help them convert potential customers to sales. Contact forms on home pages or contact pages of business websites can be programmed to automatically forward customer inquiries and feedback to either a preset email or mobile phone number or even to both. Even free, web-based email services come with mobile alert services. Get text notices when you receive new emails. With free SMS services, staying connected and keeping in touch has never been easier. Real-time free SMS services bring you closer to the world. And, with the world at your fingertips, you're never too far from people and places that are most important to you. SMS services are here to stay. As long as it is not abused, and people use text messaging responsibly, it is definitely a powerful tool of communication of the modern era. One of the most useful innovations in the mobile computing industry is the short messaging service technology or SMS. Popularly known as text messaging in some countries, this technology allows text data exchanges between mobile devices. And now, the technology has also expanded to allow PC-to-cell phone SMS services. Now, whether you're on a mobile device or on a regular PC, sending SMS to cell phones is easy. While wireless telecommunications carriers apply charges to mobile-to-mobile text messaging, SMS to cell phones from your PC is free. As a value-added service, wireless carriers allow subscribers or even the general internet public to send text messages to local numbers from their websites. Some of these facilities are only one-way PC-to-cell phone service. 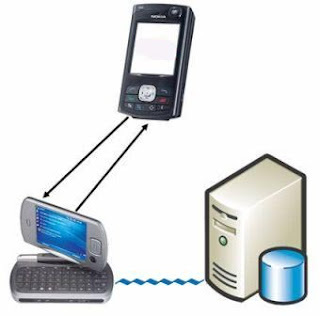 Some offer full two-way PC-to-PC text messaging. SMS to cell phones can be done online. Many websites or Instant Messaging (IM) clients offer these services for free. 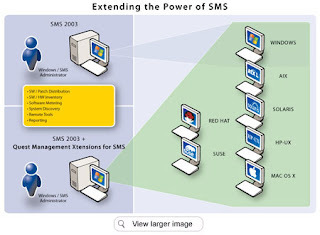 SMS services from IM clients work just like PC-to-PC chats. You can save contact details from your account online or key in a phone number to text when you want to send an SMS. IM clients usually allow the sender and the recipient to exchange messages. Commercial websites offering SMS to cell phones normally only allow one-way, PC-to-cell phone messaging. There are others though that work like an online community on the go. These facilities allows to profiles, upload photos, post and maintain blogs - all directly from cell phones. Members can send text messages, or emails may be received as text messages. You can access your account either from your phone or from a regular PC. Majority of those who text messages via computers are those from business companies who send various messages at a single time for various promotions or propaganda purposes. Computers for them are more convenient because of the QWERTY keyboard. Messages are more easily typed with this keyboard, than using a cellular phone with the number pad. These computers are installed with certain software that acts like an actual mobile phone. It has a big memory that can store millions of customers or clients' numbers, making it possible to send multiple messages to this big number of people at a single time. These messages will be received in real time. In the same way, the program can be configured to receive replies. So instead of the message going to your phone inbox, it will fall on the inbox of the program. The advantage of this is that, like an email, it can also store thousands of messages. Practically nothing has ever to be deleted. Every message can be kept for future reference if needed. It's definitely a whole new world with SMS technology. Getting in touch with your family and friends has never been easier. You can stay connected all the time. There are no monthly bills to think of. It's a great service available at your fingertips. Indeed, text messaging has become a very powerful communication tool of today. Communication has never been made easier and cheaper. For more information on send SMS to cell phone and Send free SMS message worldwide please visit our website. The younger generations have taken to SMS big time and have even started to create their own unique language and symbology for sending messages. This is a measure of how much SMS technology has been absorbed into youth culture. The possibility of a completely wireless worldwide web is becoming more and more of a reality. Mobile hand held devices such as palmtops are at the top of almost everyone's list of 'must haves'. These devices are now considered by more than half the world as essential, and not a luxury. The 'want' of the masses has now turned into a 'need,' and for some very good reasons. SMS allows us more than just a way of keeping in touch. It is an extremely cost-effective way of communicating, allowing us to watch our budget in these times of economic worry. When using SMS, typing in just over one hundred and fifty characters takes up as much space on memory as one second on a voice-to-voice call. This can represent a significant saving to anyone. So long as the cell phone is switched on, SMS messages are usually received almost instantly. They are similar to e-mails in that they can be reviewed on the screen and can be stored in your own unique filing system for as long as you need them. 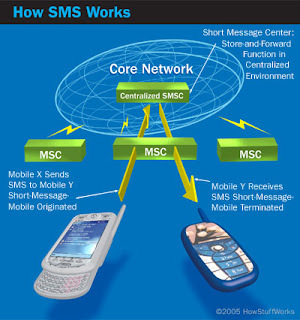 SMS also offers the facility to send out messages to large groups of people with a single click of the 'send' button. Europeans have really adopted the SMS culture and send more than a billion messages each and every month. Incredibly, this same level of SMS culture does not yet apply to the United States of America. 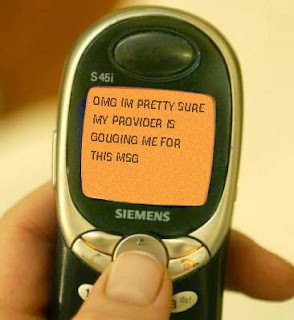 SMS service is way under-utilized in the USA, although it is growing. The main explanation of this unusual phenomenon is that the USA does not at the present time use the digital wireless interface standard used in Europe - GSM. Global Systems for Mobile Communication or GSM is the platform for all SMS communication. If you are wondering how such a tiny cell phone can hold so much information, most mobile devices can have SIM or Subscribe Identification Module cards fitted. These are essentially plastic cards with chips on which information is stored. If you are unfamiliar with the concept of SMS or have never used it, you really should give it a try. It is amazingly practical, extremely reliable and an affordable way to stay in touch with family, friends and colleagues. Mobile phones, PDAs and a variety of other mobile devices are now able to access the internet around the world. The internet is no longer the preserve of people with computers - it is now a mobile phenomenon. Though they fall short of traditional computers in what they are able to display, they are powerful tools, and will continue to evolve. Just a quick look at the differences in screen sizes will tell you a lot. Mobile devices do not display websites in the same way that computers do. Yes, there are a few devices out there that have the capability of displaying all of the content of a web page, but these devices are very expensive and usually require the presence of a WiFi hotspot. Displaying abbreviated versions of website pages will continue though until such time as these become more widely used. When using a PDA to upload a website, its obvious that the display is geared to show text which is easy and fast to download. So, given these facts, don't you think that its a good idea to cater to these types of internet users? Of course you do! When you are designing a website, you need to take into account how people will view the site. Simply by choosing a quality web design program, it becomes possible to create a mobile version of your website, with literally several clicks of the mouse. Once this new website is created, it can be embedded with a few lines of code that will automatically make this the default site for people using mobile devices. Instead of dealing with creating a new domain name or setting up mirror versions of the site that are to be used by mobile devices, your website will be able to automatically redirect a visitor to a page that is ideally suited for them. This may not seem like a big deal, and its true that mobile device users are a relatively small portion of internet users, but when it comes to making your business profitable, it pays (quite literally) to reach the widest possible audience. Transitioning to this technology can be a real pain, but if you invest in the best web design programs, you'll find the transition as easy as clicking the mouse a couple times. Don't buy website building software for e-commerce before learning how XSitePro2 has been created with top tools and wizards to set you on the path to making money from your website.